Whilst we have 4 different styles of classes here at Hartig Yoga (see below) there are a few things you can be sure of in every class. 1) You can come exactly as you are. Everybody is welcome! From all walks of life, at any age, shape and size. From complete beginners to advanced yogis. Whether you are experiencing stress in your life, or are feeling on top of the world, there is always a spot on a mat for you. Don’t feel you need to be a certain way, or wear ‘yoga pants’ if that isn’t your thing. Come as you are, friends! Just remember to book a spot. 2) You will practice with Mother Nature. 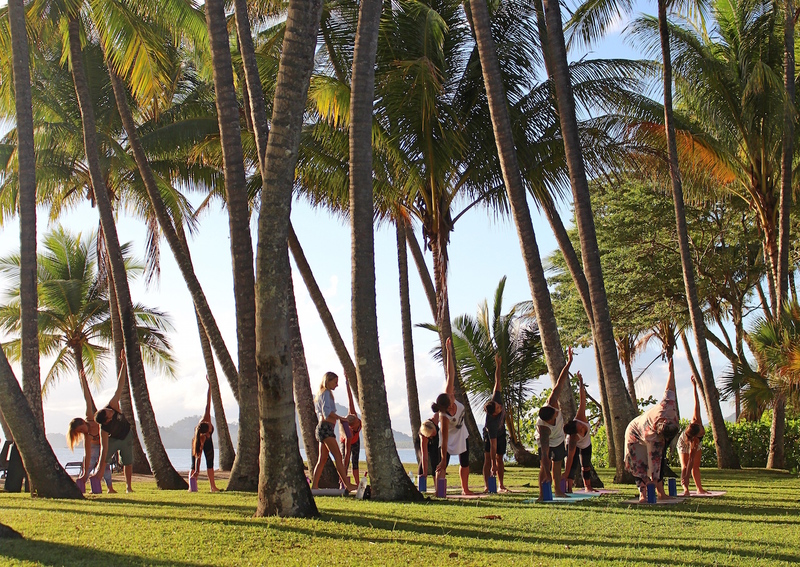 All of our classes take place in breathtaking outdoor settings. You will never want to practice in a studio again! Its the perfect opportunity to reconnect with nature and recharge your batteries. View our 3 locations (and wet weather back up) here. 3) Your practice will be enhanced with essential oils. Here at Hartig Yoga we recognise the potent power of Mother nature to help us to relax, tune in and breathe deep. Essential oils have been used during yoga and meditation for centuries. They bring a whole new dimension to the practice and greatly enhance the experience. We also hold regular workshops educating our students on how to get the most out of their essential oils and yoga practice. Shop Essential Oils here. 4) You will leave feeling better than when you arrived. Now, which style of class would you like to come to? Hatha Yoga is a general term for what we have come to know as ‘Yoga’ in the Western world. It includes some breath work and some work in postures. Hatha (Ha – Tha) translates as Sun and Moon. It is within this practice the we seek balance between the Masculine and Feminine, Yin and Yang, Sun & Moon within our mind, body & spirit. You can expect a gentle physical practice, including sun salutations and then holding standing and seated postures for between 5-8 breaths. Finishing with a guided relaxation. You will leave feeling deeply grounded and relaxed. Every Friday, 7.30-8.40am, Imagine Drift Poolside. In our Hatha Flow classes, you can expect to see a little bit more flow or movement between your Hatha Postures. We will usually have a theme or idea to focus the practice on, whether it be a part of the body, an energy centre or a poem. We usually start with a short meditation and finish with a guided savasana/relaxation. Expect to leave feeling radiant and ready for anything. Every Monday 8-9am at Sarayi Rooftop, Wednesday 7.30-8.40am at Palm Cove Beach and Thursday 8-9am at Sarayi Rooftop. This class is perfect for the evening. We start the practice in a more ‘Yang’ way, with some movement with breath and some gentle flows. We then move into our ‘Yin’ part of the practice where by we hold our postures a little longer (2-5 minutes) and find deep release in our bodies and time to check in with ourselves. These longer held postures offer a chance to practice meditation, each posture being a bite sized mediation where by you will be guided to a place of deep presence and relaxation. Every Monday 17.30-18.40pm at Palm Cove Beach. Our Rise and Shine Yoga Classes will leave you GLOWING. Expect some breathing exercises and vinyasa flow (movement with breath) to energise your body, mind and spirit. We finish with a guided Savasana. A perfect way to start the day. If you don’t usually ‘Rise and Shine’ come and give this class a try and you soon will! Every Tuesday 7.30-8.40am and Saturday 7.30-8.40am & 9.00am-10.10am at Palm Cove Beach.